Glass is a universal print surface for 3D Printing. Almost all types of filament will print to glass in one way or another. 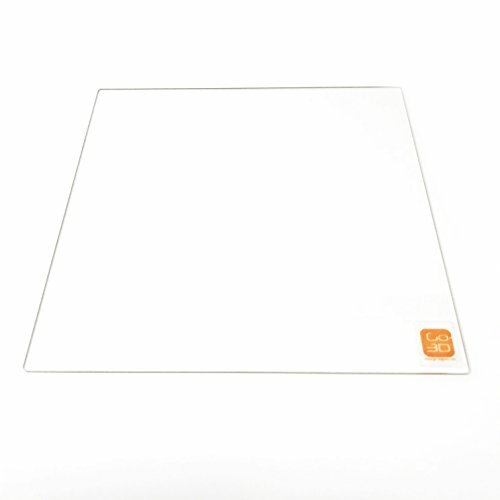 Just place the glass on your print board and clip it in place! To print with ABS or PLA, lightly spray the surface of the glass with AquaNet hairspray, then install the glass. For Nylon, we've found a light coating of UHU Glue stick seems to do the trick! If you don't yet have a glass surface, you'll want this one! This glass has been specially ordered and modified for use in 3D Printers. This type of glass is not available at your local hardware store or big box home center. Size: 310mm x 310mm x 3mm, good fit all 3D Printers with 310mm x 310mm or bigger printbed. To print with ABS or PLA, lightly spray the surface of the glass with AquaNet hairspray, then install the glass. If you have any questions about this product by GO-3D PRINT, contact us by completing and submitting the form below. If you are looking for a specif part number, please include it with your message.